You’ve probably heard people to tell you to “layer” when you’re heading outdoors for a hike, disc golf, or whatever you do out in nature. Myou think layering just means to bulk up with heavy cotton long underwear, sweats over that, and then maybe jeans, a vest, and a big winter jacket over the whole thing. This is dead wrong. Bulk does NOT equal warmth. The goal of layering is to make sure you stay warm by wearing layers that wick your sweat away from your body, insulate you, and then stop the cold & wind from getting in. Let’s break down each of these layers and show some examples of disc golf companies’ apparel which can help. We are mostly focused on the cold here but this works for the warmth as well, especially in more arid climates where it might be very cold in the morning before the blazing heat arrives in the afternoon. You’re certainly going to want to be able to remove layers off along the way…and make sure those are the correct layers to remove! The Latitude 64 & Dynamic Discs both offer a Two Tone Long Sleeve for a great snug base layer. Your body sweats to cool you off so if your skin is hot under your clothing (even if it’s freezing outside) you will start to sweat and your sweat will make you cold. Sweat is just as much your enemy just as the cold is. The number one goal of your base layer is to wick sweat away from your skin and upto your insulation (middle) layer. Synthetic fibers are best for a base layer. Cotton absorbs sweat so it is the worst thing to have against your skin when you are active in either the cold or the heat. There are a great many choices for base layers in the disc golf market. The Dynamic Discs Dry Fit Long sleeve has a nice looser fit but still wicks moisture away very well. If you are looking for a long sleeve base layer you would be hard-pressed to find a better option than these shirts (which are the same with different graphics). The Latitude 64 & Dynamic Discs Two Tone Long Sleeves fit snugly and really move with your torso and arms. It does a great job of wicking sweat away but has some more density to it. This means if it will provide a bit more heat than a less dense/lighter shirt like the Dynamic Discs Dry Fit Long Sleeve. There are also many great short sleeve shirts from Innova, Discraft, etc (including Community!) for your base layer. Anything that says 100% polyester, dry fit, or Dri-fit™ (Nike) will serve you well. Innova’s Recover Brand shirts are the softest. There are, of course, lots of short sleeve options available. 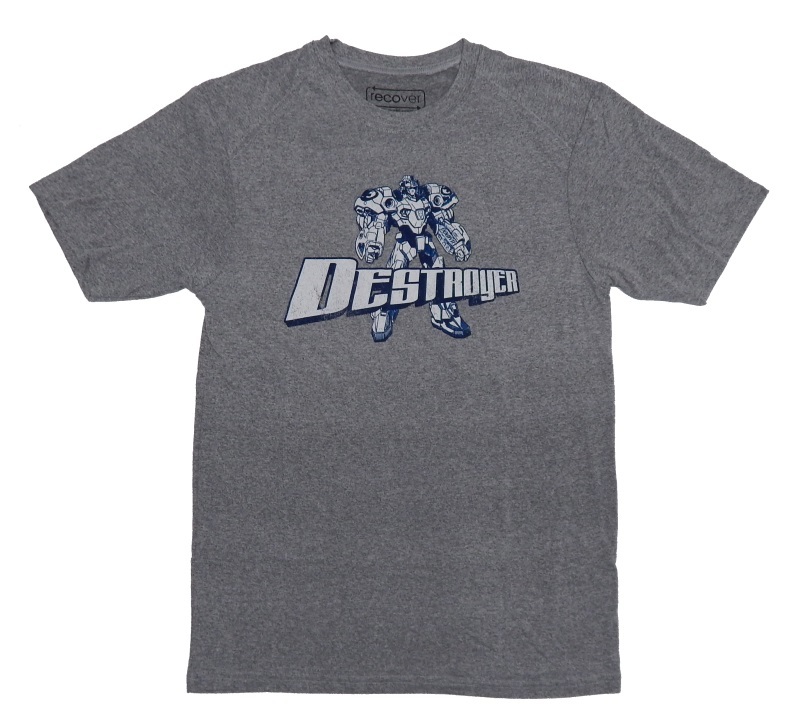 Innova recently released a Destroyer graphic on a Recover Brands shirt which is not only synthetic but also made from recycled materials. They are also extremely soft so if you don’t like the feel of dry fit shirts this is the one for you! There are also regular tees with dense and looser mesh to meet the feel you want in a shirt. Light or heavy, there is a perfect temperature for all shirts. If you are playing in a PDGA A or B-Tier event you need to wear a collared shirt. Polos are the perfect solution and you certainly don’t have to goto a 100% cotton sweat-holding shirt in order to do so. Innova, MVP, Trilogy, & even Community have some great solutions for you.